Nursery and Primary School business is very profitable because education is one of the basic needs for children and it is the desire for every parent to see their children in school and get the best quality of education. According to research for most families in the country 30 per cent of their earnings go to the payment of school fees for their children. In Nigeria today, fathers and mothers are doing all that they can to make sure their children get the best in life most especially quality education, so this is a very important aspect of our lives and that is why setting up a Nursery and Primary school business is one of the most lucrative business in the country. Setting up your own private nursery and primary school is very much possible and anyone can do, if you have the resources and requirement you will be allowed by the state government to operate your own private institution. Most parents in Nigeria do not enroll their children in government/public schools anymore, they prefer to enroll their child in a private school where they believe more care and attention will be given to the child. It is generally believed that the standard of schools owned and managed by private individuals is far higher than schools owned by the government. Also most people believe that when ones child goes to public school it is as an evidence of poverty, this is also part of the reason every parent in the country thrive to make sure their children goes to private schools and all of this make nursery and primary school is good business to venture into. Location – The first thing to do is to secure a land in a good location, if you can afford it, buy a land and build but if you can not, you can rent an apartment, this is also very possible. One important thing about the location is that it must be within your targeted customers. It should not be in an isolated area, no parent will feel safe taking his child to such a location. Choose a land that is easily accessible like in town, where parents can easily drop off and pick up their child. There should be enough space for the children to play around, it shouldn’t be too small. School Building – The cost of building a school depends on the quality and size of school you want to have. It is very important to conduct a survey of the requirements from the state ministry of education, failure to do this can result in your school being shut down. Facilities – Your classroom should be well equipped with the necessary facilities that will aid the child’s learning. For example, Library, computer lab, playground, TV, toys etc. School Registration – You will need to register your school at the Corporate Affair Commission of Nigeria. Once this is done your business is regarded as a corporate entity and you can run without the fear of being shut down. If you want to venture into this business I advise that you get a business plan to help you plan properly for the business. No successful business starts without proper planning. We have a detailed business plan for nursery and primary school business. 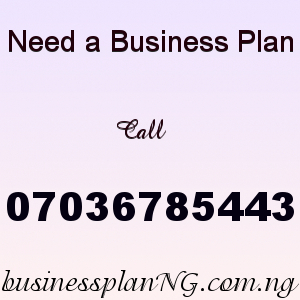 After payment text your name, your e-mail address and bank teller number to 07036785443 and you’ll receive your NURSERY AND PRIMARY SCHOOL BUSINESS PLAN IN NIGERIA / FEASIBILITY STUDY.